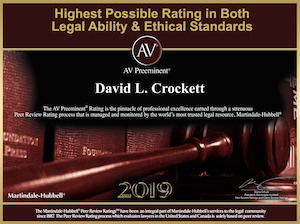 More than 30 years ago, Orange County Estate Planning Lawyer David Crockett purposed his education and professional goals such that he would garner a remarkable set of expert qualifications so he could be the BEST Estate Planning Expert one could find in California. 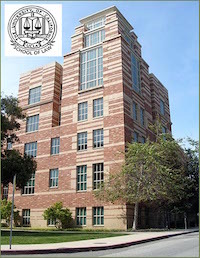 Mr. Crockett not only earned his business and accounting degree at UC Berkeley (B.S.) but also his Law Degree at UCLA (J.D.) to become an Estate Planning Lawyer and Tax Law Attorney. Next, David continued his training by working for a national CPA firm and earned a coveted Certified Public Account (CPA). To complete his triad of degrees and professional goals, David became a Licensed Real Estate Broker to better serve his cherished clients. The end result is that David has the specialized experience required to understand, interpret, negotiate and create virtually every type of legal document, trust, will, estate, complex real estate transaction, estate accounting, financial statement or tax return. This one of a kind expertise gives his clients the edge when drafting trusts, advising on asset protection, unraveling complex real estate contests and transactions, contracts, and disputes pertaining to trusts, wills, probates, estates and real estate. Three professionals-in-one unique Estate Planning Expert — virtually every Estate Plan involves understanding the short and long-term tax consequences of various trusts and how they are drafted. Moreover, the purpose of an Estate Plan is to protect various assets which typically include stocks, bonds, retirement accounts and Real Estate so that your heirs and beneficiaries will receive exactly what you want them to without ending up in a long, expensive Probate; and without finding themselves facing an unexpected and huge tax burden because you had an inexperienced lawyer or other person create an Estate Plan without the accounting and tax law knowledge necessary to eliminate or minimize future tax liabilities. 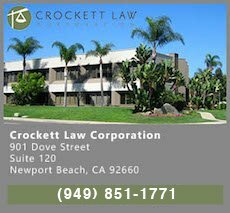 Orange County Tax Attorney and CPA David Crockett has extensive knowledge of state and Federal tax laws and even does many of his client’s tax returns. Having an estate plan benefits you and your loved ones in the event of your incapacity and upon your death. Making an estate plan now, while you are mentally and physically healthy, will enable you to decide on the appropriate fiduciaries to handle your affairs. Without an estate plan, the Probate court will appoint a conservator should you become incapacitated and will appoint an administrator upon your death with high mandatory attorneys fees. For example, mandatory probate attorneys fees on a $1.5 million estate are $28,000 but if you have a living trust and avoid probate the fees to administer the estate are typically less than 1/3rd of that. The Probate court will also appoint guardians (who you might not agree with if you were alive to object) for your minor children. By making the smart and savvy decision to take some time to plan now, you will make these life-changing decisions yourself instead of leaving it up to some complete stranger at the Probate court. Estate Planning refers to planning the distribution of your estate which can happen while you are alive and/or after your death. An “Estate Plan” is a comprised of a set of estate planning documents that are tailored just for your unique life circumstances. Typically, when an Orange County estate planning attorney prepares an estate plan for you, it will consist of the following documents: (1) Will, (2) Trust, (3) Durable Power of Attorney, (4) Deeds transferring property into your Trust, (5) notifications to the county tax assessor; (6) Advance Health Care Directive, (7) Trust Certification, and (8) other necessary ancillary documents. A Will is generally drafted as a companion document to your Revocable Living Trust. The Will is a “catch-all,” for all assets (e.g. cars, furniture, jewelry, and other personal property) that is not held in your Trust. Any assets that were not specifically “funded” into your Trust by the time of your death, are “caught” by your Will and then “poured” into your Trust. This type of Will is often referred to as a pour-over Will. Your new Will is the critical document of your Estate Plan where you will specifically name the guardian(s) of your minor children. The combination of your Will and Trust should disperse all of your estate assets to the beneficiaries of your choosing. A Durable Power of Attorney is the document that allows you to appoint an Agent, (often called an “Attorney-in-Fact”) who will make financial decisions on your behalf should you ever become incapacitated. Similar to a Durable Power of Attorney, your Orange County Estate Planning Attorney will draft an Advance Health Care Directive that is the document which legally appoints an Agent (that you choose) to handle any health care decisions for you should you ever become incapacitated. People with more complex situations might need some advanced estate planning. 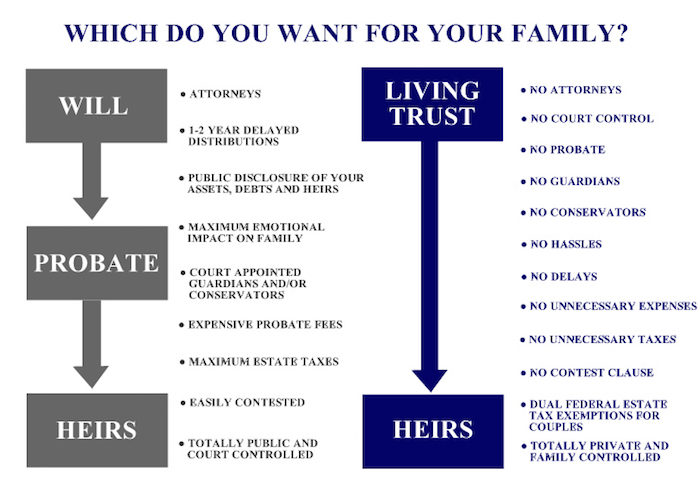 People with large estates, in excess of the federal estate tax credit amount or applicable exclusion amount which is $5.35 million per person in 2014, will likely benefit from one or more of the following estate planning strategies and associated estate planning documents which are used as stand-alone for a unique challenge or combined into an overall estate plan. Other components of Estate Planning include exploring the legal and tax planning benefits of forming LLC’s and other legal entities, business succession planning, asset protection planning, and property tax reassessment issues. What Are the Benefits of Preparing an Estate Plan? Your Final and Last Gift You Will Ever Give — Will be So Appreciated! Proper estate planning is a lasting gift - you can give to your loved ones. Your kids, heirs and beneficiaries will remember you as being a smart, prudent and thoughtful for preventing a huge mess for them to clean up if you become incapacitated or die.